Home » AMP for emails, next big thing on email after email? Email may seem archaic but it’s still the preferred channel of communication. Emails remained static and boring for so long but lately, there’s been tremendous progress in making emails interactive and immersive. On one hand, we have marketers who avoid the mass one-size-fits-all emails, favoring a more personalized, data-driven dialogue. And on the other, we have Google and other ISPs constantly updating their algorithms and platforms to improve user experience with email. The recent announcement of bringing AMP (Accelerated Mobile Pages) to email is another such attempt by Google to make email more interactive and engaging. 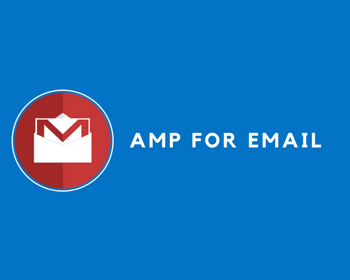 Let’s talk about AMP and what it means for email senders. But first, what is AMP? Accelerated Mobile Pages (AMP) is an open source project by Google to support faster loading mobile pages for devices. According to Google, the AMP for Email feature will allow you to browse and interact with content, such as, filling out forms without leaving the email client. Is AMP good for all? AMP for email is a revolution in the making; designed to take email interactivity to new heights. Let’s see how it impacts different stakeholders. With a growing culture of impatience, with everyone wanting everything NOW, customers can eliminate unnecessary clicks in emails and avoid time waiting for pages to load – which can potentially be a break point in the experience. With AMP, Google gives users content at speed. This content can be fresh, updated and actionable even if the emails are old. While all this sounds good, it definitely requires a shift in the mindset of customers. It may take a while to get comfortable with this feature and understand that they can now engage with emails beyond just clicking a CTA button. By extending AMP to email, Google empowers customers to do more in an email. AMP is a significant technology change for brands. It’s more than just downloading a plugin and getting started. It means enhancing skills in-house or outsourcing to develop AMP-compatible emails. With that challenge met, brands using email as their primary channel for acquisition may see a surge in their conversion rates, as the required actions will be taken in the email itself, rather than on a landing page. In order to adapt AMP for emails, ESPs need to align a new MIME part to their systems, which can prove a big challenge. Usage of AMPs might also increase the size of emails; this need to be tackled, by keeping both commercial requirements and deliverability in mind. AMP is another attempt to extend control over the user’s data. Google already knows a lot about its users. And it’s not a bad thing. It’s obvious that Google scans our emails to provide relevant ads. But, do we need Google, or for that matter, any email provider, to handle our daily incidents within our inbox? Did users ask for this? When can I start using AMP for emails? Google has made AMP for email specifications available to developers, who can now signup for preview access through Google. User support will be available in Gmail on mobile and desktop later this year. It seems that the timeline for AMPs actually coming to Gmail is quite unclear. Current adopters of AMP for emails include Pinterest, Booking.com and Doodle. AMP in email is thrilling and possibly the best innovation in the email space. With AMP for email being an open source specification, it will be interesting to see how other email clients will adopt this.